Sukhdev Vihar near Okhla; Delhi residents filed a case in the Delhi high court against the Okhla waste-to-energy plant. Local residents have opposed the plant. The report also claimed that an untested and unapproved Chinese incinerator technology was being used in the plant. The case was transferred to National Green Tribunal on January 23, 2013. Representatives from Delhi government has failed to appear before the tribunal. The Uttar Pradesh government has also objected the waste-to-energy plant which is running within the 10-km eco-sensitive zone of the Okhla Bird Sanctuary without the approval of the National Board for Wildlife (NBW). Waste recyclers grouped in a recyclers' union are against this incinerator that will deprive them of he means for their livelihood. The plant falls in the Delhi government’s area of jurisdiction while the birdlife sanctuary lies in UP. Updated, 8 April 2018. The location is Sukhdev Vihar near Okhla. This is a case where local residents refuse to bear the risk of an incinerator (having learnt about danger from dioxins), and a strong movement of waste pickers also opposed incineration of waste because this “expropriates” their customary rights to recycle waste and make a living out of it. Metabolic contestations in cities in the global South—and waste conflicts in particular—involve struggles over values and livelihood as well as health and wellbeing. (Demaria and Schindler, 2016). There has been an increased role for the private sector in the various stages of waste management in cities. Delhi has been at the forefront of this shift and this has brought out conflicts over collection and disposal of waste. It was argued that the informal sector should be meaningfully incorporated into an efficient and equitable waste management system that is also environmentally sustainable and does not damage the recyclers’ health. Instead, the incinerator in Okhla is in operation. The case of Okhla ran in parallel to that of another smaller incinerator in Gazhipur. They are still exceptional in India where industrial incineration of urban domestic waste was quite new. But the conflicts were not so different from many other cases in China and elsewhere of opposition to incineration by neighbours. On the other hand, the case is also similar to cases in cities in India and other countries (Pune, Bogota) in which unions of urban waste recyclers successfully oppose privatization and incineration of waste, and defend their livelihoods, while rightly claiming that their task provides environmental benefits. In Delhi, a number of trade unions have been active demanding continuing access to waste faced with privatization and incineration, such as All India Kabadi Mazdoor Mahasangh (AIKMM), Safai Sena, Delhi Kabadi Mazdoor Sangh, and Green Flag. These unions organize rallies and demonstrations, and their demands have targeted local officials and private firms. For example, AIKMM organized a demonstration outside of the Delhi headquarters of the United Nations in 2011 to protest the inclusion of the Okhla and Ghazipur waste‐to‐energy plants in the Clean Development Mechanism's carbon credits scheme. The effectiveness of grassroots unions is however limited. 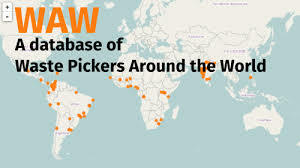 Demaria and Schindler (2016) quote several comments of waste pickers typically understanding the conflict as a struggle for their livelihood: “Since we don't have any other work we are forced to do this filthy work. We are forced to pick up this waste. Still the government is trying to force us out. They want to produce electricity by burning our livelihood”. “The work of the waste‐to‐energy plant is to burn things. They know that [inert and organic] waste never burns. They are trying to burn things [recyclable material] from which we earn our living. Therefore, we are opposing the waste incineration plants.” Nevertheless, despite such claims, waste‐to‐energy plants are perhaps meant to become the cornerstone of Delhi's waste management system. Currently two waste‐to‐energy plants are operational in Okhla and Ghazipur (south and east Delhi, respectively) and more are planned. The case of Okhla was transferred to the National Green Tribunal on January 23, 2013. The Uttar Pradesh government also objected the waste-to-energy plant which is running within the 10-km eco-sensitive zone of the Okhla Bird Sanctuary without the approval of the National Board for Wildlife (NBW). There was then a confluence of urban middle class dwellers concerned about risks of dioxin, nature conservationists, and a strong movement of waste recyclers against the Okhla incinerator that will deprive them of the means for their livelihood. Demaria and Schindler (2016) conclude that there are possible alliances between waste pickers and a local middle class. While waste pickers’ main objective is to configure Delhi's metabolism in such a way that they maintain access to waste, middle class residents envision a metabolic configuration and waste disposal methods that insulate them from waste and from the risks of incineration while enabling their desired lifestyle. In Dehli such an alliance was temporarily stronger in the case of Gazhipur than in Okhla. The outcome at the NGT was eventually favourable to incineration. As reported in The Wire (in an article signed by a Indian member of GAIA, the international global alliance against incineration), “After four long years, the National Green Tribunal (NGT) sealed the fate of more than half a million people living around the controversial waste-to-energy (WTE) incinerator in the Okhla region .... The highly polluting plant had been a bone of contention between the residents of Sukhdev Vihar and the Jindals (a large industrial firm) who own and operate the facility. In a 142-page order dated February 2, 2017, the bench – headed by Justice Swatanter Kumar – observed that the Principle of Sustainable Development leads to some inconvenience and thus causes some impacts on environment. Unless such impact and effect is irretrievable within the limit of Sustainable Development, the Tribunal would be inclined to permit such plants to operate … The NGT has been hearing the Okhla WTE case since February 2013. During its course, the bench had made several observations regarding the risks the plant poses to public health, environment and the violations in the environmental clearance terms and conditions. However, contrary to its own observations made earlier regarding such violations, the tribunal (finally) ruled in favour of the project’s proponent. The question is whether “… an entity tasked (as the NGT) with the duty to uphold the law (can) be allowed to justify violations by applying utilitarian logic?”. In other words, who has the power to allow or exclude valuation languages different from cost-benefit analysis or sustainable development? Should not the precautionary principle prevail? Which is the metric used to compare costs and benefits to different social groups and interests? Project Details According to Delhi Pollution Control Committee (DPCC), already beforel 06.3.2012, a total of 27,469 Metric Tons of municipal solid waste had been utilized and 3,250 Metric Tons of waste was lying in the collection/storage pit in the plant. This plant generates about 3 MW energy using the municipal solid waste in Delhi. Relevant government actors Delhi Government. Development of Alternatives Local residants are ready to give their open rooftop area that can be dedicated to solar panels. They have volunteered the space to generate solar power to show there is not need for turning waste to energy. Residents wants the waste to water plant to be stopped or transferred from the locality . Recyclers unions propose that cooperatives or unions working in better conditions would recycle the waste. Why? Explain briefly. 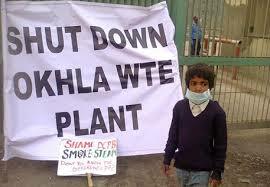 Local residents filed case against the Okhla waste-to-energy plant in Delhi High Court in 2009. The case was transferred to National Green Tribunal on January 23, 2013. Representatives from Delhi government failed to appear before the tribunal. The reason is not known. In 2017 the NGT decided in favour of incineration. Demaria, F. Schindler S. (2016). Contesting Urban Metabolism: Struggles Over Waste‐to‐Energy in Delhi, India. Antipode, 48(2), p. 293-313.